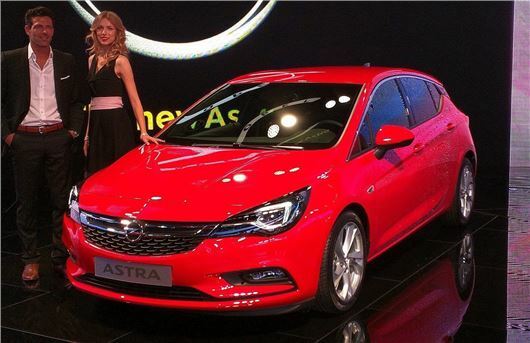 Vauxhall has given the all-new, UK-built Astra its public debut at the Frankfurt Motor Show. The new car is lighter than before in an effort to improve fuel economy, plus it comes with an up-to-date range of safety and driver assistance technologies. Prices start at £15,295 and first deliveries are due towards the end of 2015. The new model is slightly smaller than before, but more intelligent interior packaging means it remains spacious, with more leg room than in the outgoing car. The reduced size and weight improve economy, with the most frugal diesel officially capable of more than 90mpg. The most popular engine is expected to be the 1.6-litre CDTi, which Vauxhall calls the “whisper diesel.” This will be available in 110PS, 136PS and 160PS outputs, plus there is a 145PS 1.4-litre turbo petrol and, in entry-level models, Vauxhall’s impressive 1.0-litre tubrocharged petrol with 105PS. Technology includes infotainment with Apple CarPlay and Android Auto, along with a subscription-based in-car WiFi system using a built-in 4G sim card. There are also full-LED lights like those seen on expensive Audi models, automated lane keep assistance and following distance warning.